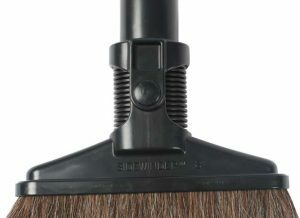 The patented Sidewinder tool series was developed by an experienced contract cleaner seeking to increase his associates productivity by changing from the traditional push pull motion utilized with conventional cleaning nozzles to a vertical design which accommodates sweeping in an arc similar to what one would have done when mopping. 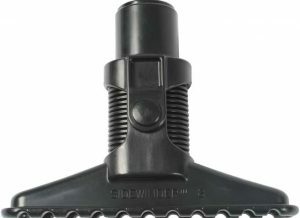 The flexible neck permits the Sidewinder tool to find the surface being cleaned regardless of the angle. This benefit is especially evident when cleaning above the floor as the tool adjusts to the surface and angle of the wand rather than your associate always having to adjust their posture or arms to keep the tool level to the surface. 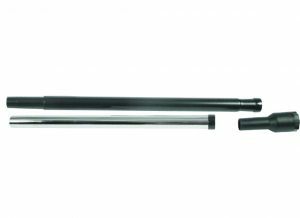 Available to fit both 32mm (1.25”) and 38mm (1.50”) cleaning wand systems Side-winder tools are available in designs for carpet, hard floor, upholstery, vertical walls, and elevated horizontal surfaces. The Sidewinder series is available in tool lengths of 20cm (8.0”) 38cm (15.0”) and 45cm (18”) as plush natural fill brushes or as a carpet tool. The popular 38cm (15.0”) single blade squeegee tool captures moisture on both sides of the blade in a way similar to a traditional window squeegee for improved productivity. Productivity. An individual cleaning with a traditional 14” floor brush, carpet tool, or upright vacuum will typically clean 2,500 to 2,700 square feet of space per hours. the arc shaped sweeping motion resulting from the vertical presentation of the Sidewinder allows an individual to effectively double the surface area per hour by expanding the width of the cleaning path. 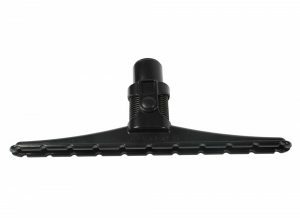 the flexible neck lets the tool move through this area perfectly aligned to the cleaning surface for more effective cleaning in a single pass. the Sidewinder tools are ideal for back-pack, for use with central vacuums, wet and dry canister vacuums, and the developing market for cart mounted vacuum systems. Better detailing. 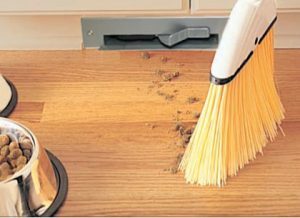 the easier a tool is to use the more effective the cleaning. the vertical presentation of the Sidewinder as compared to the horizontal presentation of conventional tools permits access to areas traditional tools can’t reach. the extended low profile easily passes under cabinets, shelves, and chair trolleys. 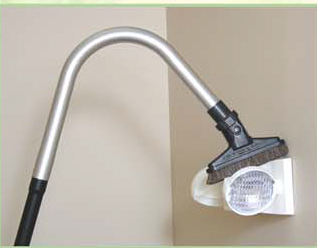 A Sidewinder tool can pass into tight spaces between wall and cabinets, desks, chairs, and tables eliminating the need to move furnishings to effectively clean. the Sidewinder tapered profile finds its way under and around electrical cords, computer wires, television cords, and telephone leads under desks in your home or office cleaning areas often neglected with traditional tools. the Sidewinder will result in faster more effective detailing resulting in a satisfied client or home owner. Upright Posture. A comfortable erect standing posture is encouraged by the unique vertical presentation and flexible neck of the Sidewinder tools. this erect posture results in more user comfort as one cleans open spaces and is fully recognized as one cleans in and around home or office furnishings. the flexible neck allows one to stand comfortably upright and extend well beyond the depth one would encounter cleaning under a desk. When used with a backpack the Sidewinder eliminates the need for bending down to get under desks which results in back strain as the weight of the backpack leaves your hips and transfers to your lower back. this same advantage can be captured with tank vacuums through the use of a slightly longer hose. Sidewinders flexible neck makes it ideal for cleaning elevated horizontal surfaces which would normally require the use of ladders, scissor lifts, or cherry pickers. Sidewinder tools are ideal for cleaning vertical surfaces large and small by selecting the appropriate tool width for the area being cleaned. The light weight aluminum wands are so light weight they can be easily lifted and controlled with one hand. Available in a full natural fill for fast efficient hard floor cleaning Sidewinders are ideal for hard wood floors in home or office. A soft single blade squeegee tool captures water on both sides of the blade as one moves across a surface. 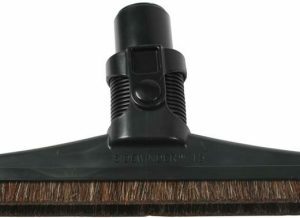 The single blade is ideal for clearing water from grout lines on tiled floors. Use the 18” carpet tool to gobble up open spaces and clean surfaces impossible to access with traditional tools. Commercial Use: The Sidewinders cleaning arc covers open areas faster than traditional tools by increasing the width of the surface addressed in a single pass. 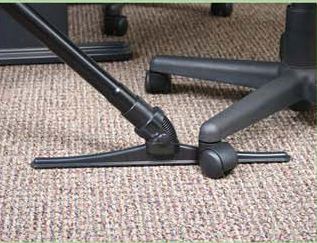 In a typical office one can stand comfortably in the center of a room and easily clean the whole space by simply turning to the area needing attention.In addition to the floor space covered in a single pass the flexible neck keeps the tool paralleled to the surface as one reaches forward to clean under desks, or furnishings. 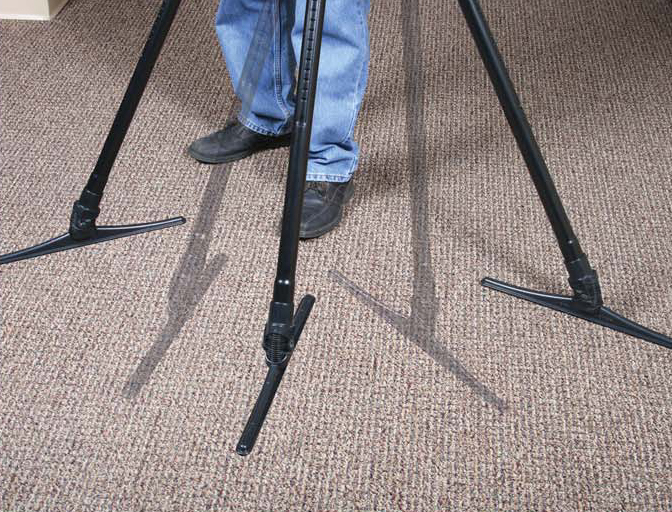 Sidewinder tools work as effectively in warehouse and production spaces as they do in the home or office. 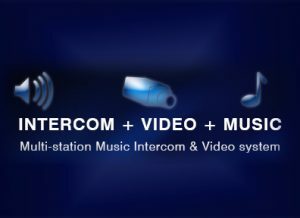 They are great in and around work stations and production lines. Above-the-floor use is just as valuable an application for Sidewinder. The flexible necks allows the tool to track the wall as it moves across or up and down the vertical surface. Return air vents, downward cast light fixtures like can lights, a shallow ledge all demonstrate the advantage of the flexible neck. 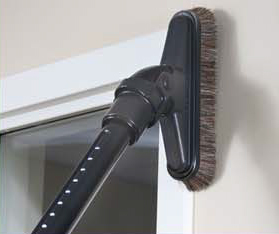 The curved wand allows access to elevated horizontal surfaces. Again the flexible neck lets the tool rest flat to the surface or if the surface is uneven to track as close to parallel as possible.